Outdoor game is very fun activity in weekend or holiday. It will more funtastic if you having outdoor activity with your friends, family and children. Add to the fun with our big checkers product! 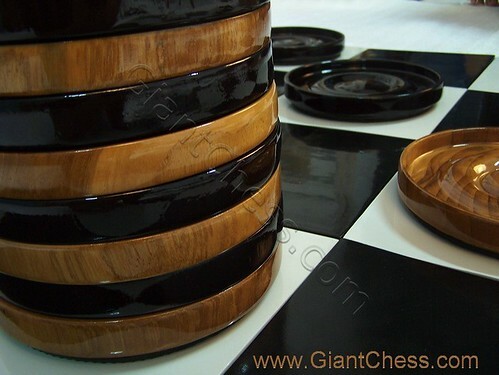 We have unique and good quality product for our customer, giant checker pieces. Our checker pieces is sturdy yet lightweight but easy to lift. You can use it for outdoor game or as house decoration. Very simple but so attractive. Our giants checkers add the colossal fun to your backyard. Our checker products are idela for indoor or outdoor play.This set is constructed of the best quality of Teak wood, carved by our professional craftsman and polished well in black and brown. Perfect for garden, backyards, schools, recreation centers, country clubs, resorts, and camps. You can put it at your garden in long time without worry about the damage, because our product is made from best quality of Teak wood.